Proponents state that pipelines are more efficient and safer than using rails, roads or shipping oil across the Great Lakes. In addition, Michigan relies on the propane Line 5 delivers (65% of the propane that heats Upper Peninsula homes). Last, according to some locals, Enbridge does a great job of maintenance and monitoring. Recently, in response to demands from conservation groups and politicians of both parties, a new agreement was signed that calls for many things including shutting down the lines when waves in the Straights reach 8 feet or more, for more than 60 minutes. The reason for stopping the flow in extreme weather is that corraling and recoving any spilled oil would not be possible. There are many unknowns (how would a wintertime line rupture be addressed?, how would the current affect the dispersal of oil?, what will it take to move oil safely to refineries in the future? ; etc.) and the issue is complex. For an in-depth and fascinating coverage of this issue, see Dan Egan’s introduction to Oil and Water, Parts 1 and 2, at https://projects.jsonline.com/news/2017/1/15/intro/oil-and-water.html. 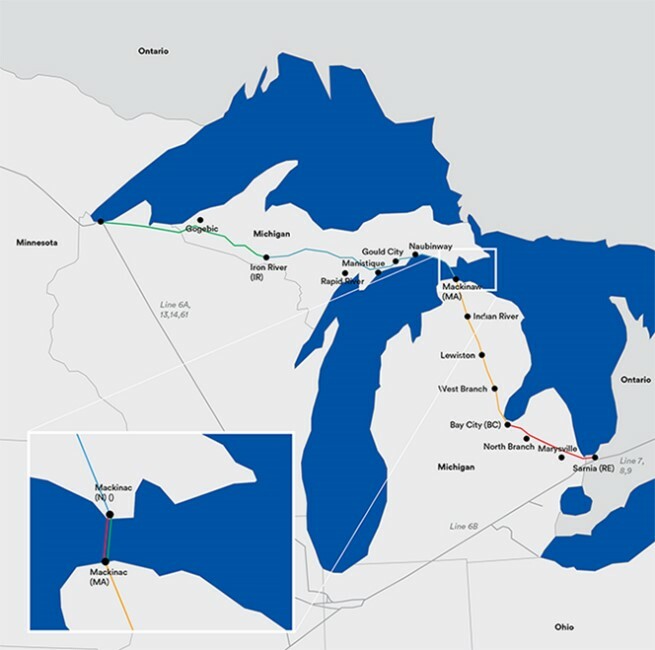 Published on Jan 23, 2017 Great Lakes, Bad Lines Discover the story of two Michigan born adventurers and their 500-mile, fossil-free journey across the Michigan’s Upper Peninsula along the route of Enbridge Oils Line 5, a 64-year-old pipeline that threatens our inland waters and Great Lakes.